The Church is entered through a 16th century porch, reconstructed in 1895-6 to the original design when the north aisle was rebuilt. 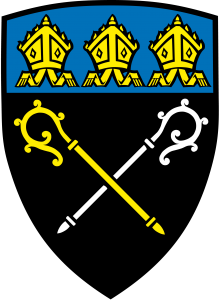 The Church is cruciform in shape, with a nave and north aisle, a central tower and crossing, north and south transepts, and presbytery with chapels either side. The north transept and chapels were demolished before 1803. The Norman aisle has been rebuilt twice—the present aisle was constructed in 1895, replacing the wider 16th century aisle and reverting to the original line of the 12th century aisle. A ramped access to the monastic end was added in 1999. The stained glass in the west window of the north aisle was inserted in 1935, depicting Elizabeth, the mother of John the Baptist, and St Luke. The door at the east end led into the north transept, now a vestry. 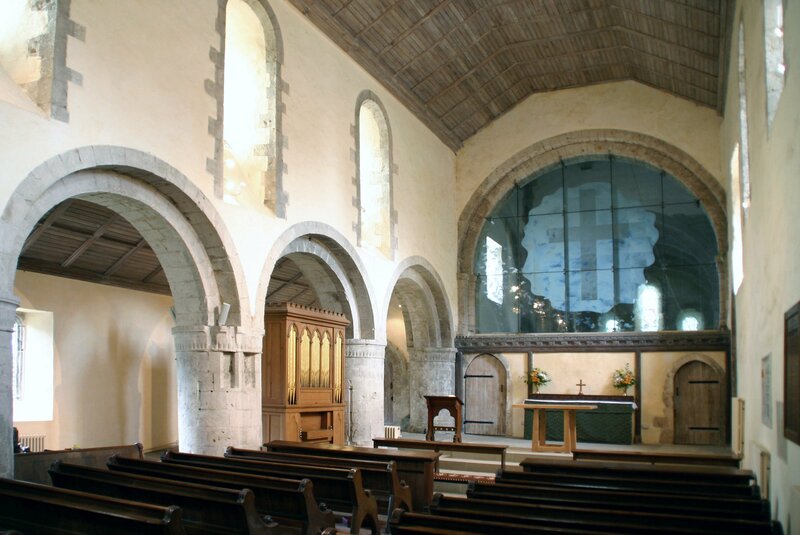 The nave originally extended a further 5 metres westward, but when that section became ruinous, a new west wall was built in 1803, and the original Norman west doorway moved to the garden of the Priory House. In the restoration of 1999, the original west bay was rebuilt to provide a kitchen, toilet and vestry. The west window was inserted in 1929; the glass depicts the birth of Christ and the angel appearing to the shepherds. The round nave pillars have moulded bases and scalloped capitals. The clerestory windows are not set above the arches, as was the normal custom, but over the pillars, allowing for a larger window as the base falls below the level of the top of the arch. The eastern-most south nave window was added in the 16th century to throw more light on the altar. 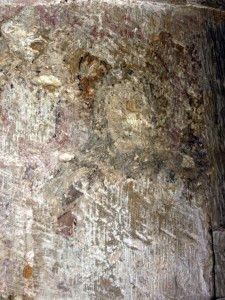 On the second pillar from the west can be seen the faint remains of a painting, depicting the upper part of a male with a haloed head, and wearing a cloak. 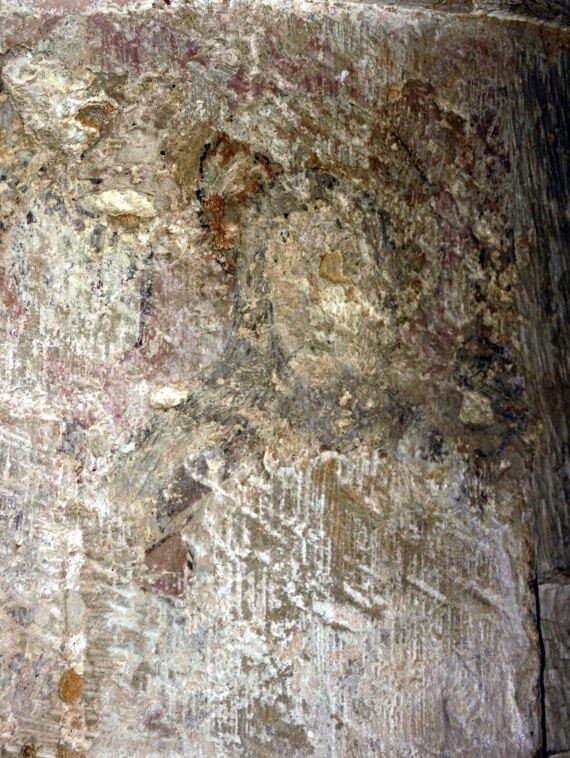 Stylistically, this would seem to date from about 1140, when perhaps the church was painted throughout to mark its confirmation as a Priory. It reminds us that the Priory Church in medieval times would have been a blaze of colour. 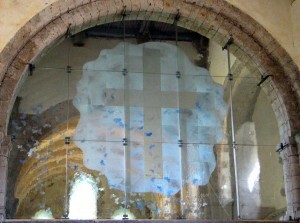 The baptismal font is decorated with mouldings at the rim, centre and base, and is probably older than the church. My nails are drove, my work is done. The organ is mid-19th century, built by William Sweetland of Bath, and was originally in the Lady Chapel of Wells Cathedral. 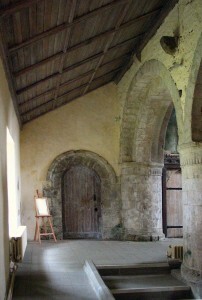 The south-east door led into the Priory cloisters, used by the monks for meditation and exercise. The monastic buildings no longer remain.